Are You Getting Our Emails? Update Your Subscription Preferences! La Brea Avenue Decking is Complete! La Brea Decking completed 6 weeks earlier than expected! The project, anticipated to take 22 weekends finished in 16 weekends. K-rail barriers will continue to remain in place on the south side of Wilshire from Detroit to Orange for utility hanging under the deck and to help start excavation activities. The next phase of work will include station excavation, deck opening deliveries and street restoration. Under the decking, station excavation will occur continuously until tunneling begins. Excavation will happen from the staging yards and the majority of removed soils will be transported off-site. The design-builder will also be delivering materials under the decking throughout the project. This will require temporarily opening the deck panels to lower materials under a non-peak hour lane closure. Thank you to everyone for your patience and understanding while the Purple Line Extension is being built. The Purple Line Extension Subway Project has been engaged in construction activities along Wilshire and La Brea since August 2013. Work began with advanced utility relocation (AUR) activities, followed by major subway construction in late 2015 with pile installation. The underground piles form the support structure for the excavation of the subway station box at Wilshire/La Brea. After piling we began decking, which is a construction process that entails excavating the street and sidewalks, and replacing them with temporary concrete deck panels. The deck panels will serve as the temporary roadway and sidewalk while underground work and excavation continues. This will allow traffic to continue to flow while maintaining access to sidewalks and driveways, as construction continues underground. In the Wilshire/La Brea area, decking occurred on Wilshire Blvd. stretching from Detroit St., through the La Brea Intersection, to Orange Dr. This work – excavating Wilshire and placing steel beams and deck panels across the street – occurred over a span of 16 weekends which started in June 2016. 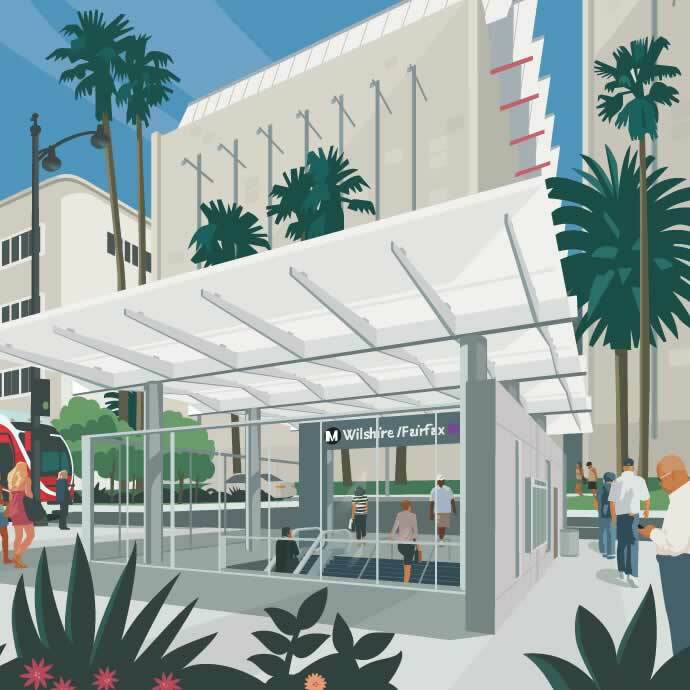 El proyecto de extensión de la línea morada de Metro se ha dedicado a las actividades de construcción a lo largo de Wilshire y LaBrea desde agosto de 2013. El trabajo comenzó con las actividades de reinstalación de los servicios básicos avanzados (Advanced Utility Relocation, AUR), seguido de la construcción más importante del metro con la instalación de pilotes a finales de 2015. Los pilotes subterráneos forman la estructura de soporte para la excavación de la estación del metro en Wilshire/La Brea. Después de instalar los pilotes, empezamos el trabajo de entablado, que es un proceso de construcción que implica la excavación de la calle y las aceras para reemplazarlas con paneles temporales de cubierta de concreto. Los paneles de cubierta servirán como calzada y acera temporales mientras continúa el trabajo y la excavación subterráneos. Esto permite que el tráfico siga fluyendo y se mantenga el acceso a las aceras y calzadas, mientras continúa la construcción subterránea. En el área de Wilshire/La Brea, el trabajo de entablado se realizó en Wilshire Blvd. y se extendió hasta Detroit St., pasando por la intersección de La Brea, y hasta Orange Dr. Estos trabajos (la excavación en Wilshire y la colocación de vigas de acero y paneles de cubierta por toda la calle) se realizaron en un lapso que comprende 16 fines de semana, a partir de junio de 2016. 퍼플 라인 확장 지하철 사업은 2013년 8월 이래로 Wilshire와 La Brea를 따라 공사 활동을 진행하고 있습니다. 작업은 후기 공익사업 재배치(Advanced Utility Relocation, AUR) 활동부터 시작하여, 그 후 말뚝 설치와 함께 2015년 말에 지하철 대공사를 실시했습니다. 지하 말뚝은 Wilshire/La Brea에 있는 지하철 역 상자 굴착을 위한 지지구조물을 형성합니다. 말뚝 작업 후 데킹 작업을 시작했고, 이것은 도로와 보도를 굴착한 후 그 자리를 임시 콘크리트 덱 패널로 바꾸는 공사 작업입니다. 덱 패널들은 지하에서 공사 및 굴착 작업이 계속되는 동안에 임시 도로 및 보도 역할을 합니다. 이렇게 함으로써 공사가 지하에서 계속되는 동안에도 보도 및 진입로 접근을 유지하면서 동시에 교통은 계속 흐르게 됩니다. Wilshire/La Brea 지역의 경우, 데킹 작업은 Wilshire Blvd. 상에서, Detroit St부터 La Brea 교차로를 지나서 Orange Dr까지 실시되었습니다. 이 작업(Wilshire를 굴착해서 도로를 가로질러 철재와 덱 패널을 설치)은 2016년 6월에 시작하여 16주 주말에 걸쳐 실시되었습니다. Bus stops were relocated. Review Service Alerts for details.